So another year has passed and we are just hours away from 2016. To me this year was amazing and I was very fortunate to be able to live it to the fullest! This post will be just a short recap of what had happened.. 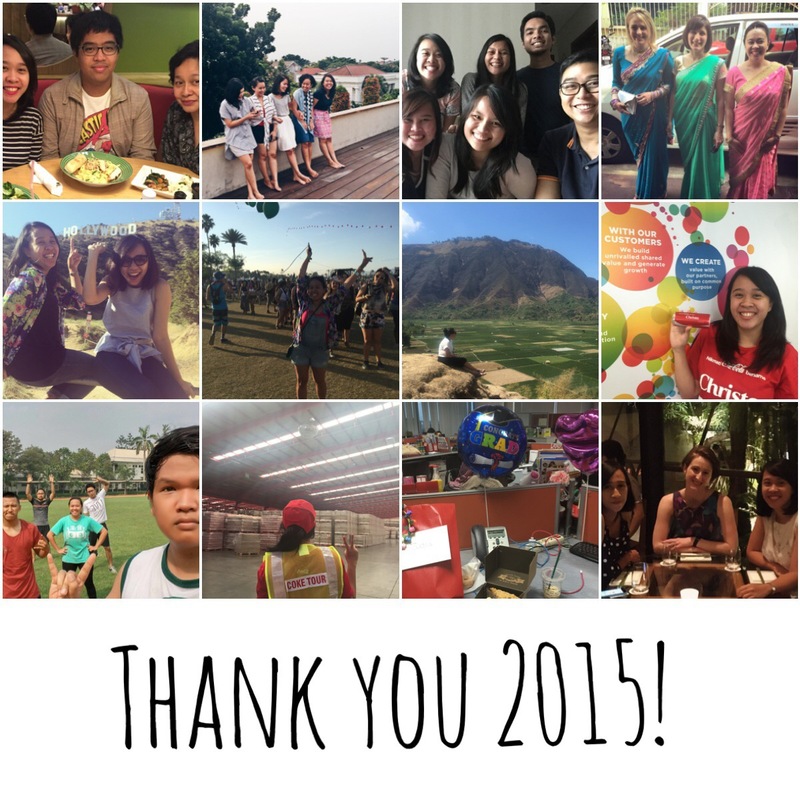 I started January by exploring Jakarta – became a tourist in my own hometown. I stayed in Teduh Hostel over the weekend with my friend Della and we had so much fun exploring the town. I can say that January was a good start to 2015. In February I had the opportunity to move to another division at work which I think was the pinnacle of my career at my previous company. Of course March was special, it was when I went to India to attend a friend’s wedding. The trip was special – the friends I met again after 5 years, the food, the culture, everything! Will definitely go back and explore more parts of the country. And how can I not love my April? I went to the US, was reunited again with my boyfriend after not seeing each other in flesh for 2 years, and WENT TO COACHELLA! super happy! In May another dream of mine came true, my article was published in June edition of CLEO magazine. Yayyyy! Well June, July, and August were busy, I had to catch up with a lot of work that I left while traveling (haha of course…), but I managed to spend some time also with family and friends. I also went to Singapore in July for a job interview which I could not share previously but because I have finally joined the company, I guess it’s now safe to say.. hahaha. In Singapore I got to meet brilliant minds from all over Asia and although I did not get the Singapore-based position, still I think the interview process did change (some of) my perspective about career. Yep, in October I made a rather impromptu decision to join my friends’ tour and traveled to Lombok. Another new destination in my traveling list, I was mesmerised by the beauty of the island. Then in November I received a life-changing news as I suddenly received an offer from the company that invited me to Singapore in July. Surely it was one of the toughest decision, but I decided to tender my resignation this month. I also started to exercise regularly as I joined a training group with my high school friends. Finally, my December was crazy! I resigned and started the new job immediately the following Monday. I went to Bali with my friends from the UK and celebrated Christmas a.k.a my Birthday in the beautiful island. Super fun month! Some highlights of the year! So, my 2015 was definitely full of blessings. I was blessed to be able to travel, to meet people, to see some of my dreams came true.. and so much more. This year I learned to explore, to get out of my comfort zone, live my life to the fullest, and finally I learned to be happy. Senang banget rasanya melihat teman-teman mengalami banyak perubahan positif dan perkembangan menjadi yang lebih baik di 2015. Selamat buat pencapaiannya sepanjang tahun ini Mbak, semoga tahun depan bisa jadi lebih sukses dalam segala bidang terus tetap rukun dengan orang-orang terkasih. Juga tambah semangat buat blogging! happy new year ya chris!